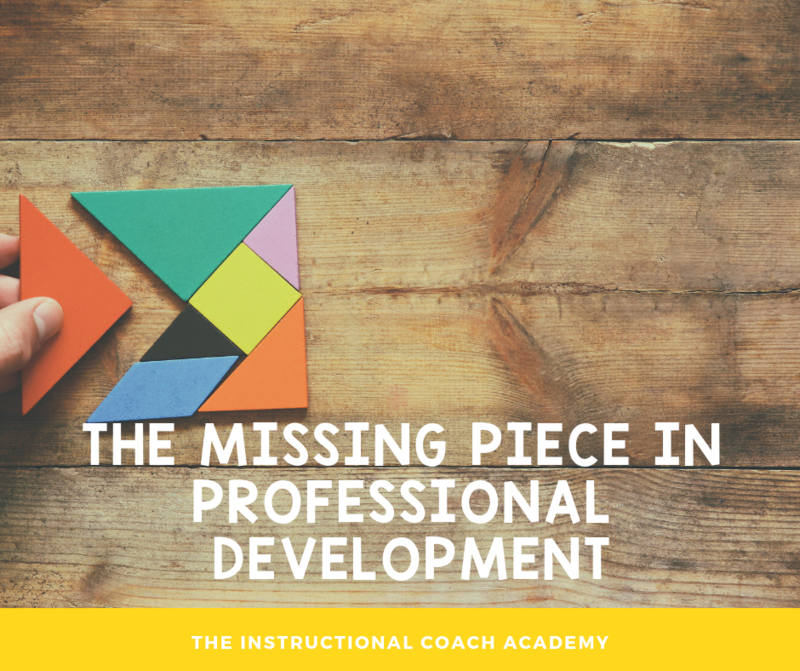 What is the missing piece in most professional development sessions? Why is it so hard to change teacher behavior in learning new knowledge? What can we do to make teacher learning stick? We’ve all asked these questions. No matter how thoroughly we prepare or how high quality the professional development provided is, teachers say “We need more training.” What?! How can that be? We just spent a gazillion dollars to give you tons of hours to learn with experts. I busted my backside to give you everything you need. What training could you possibly still need? On-going support-you guessed it, check. After years of learning, struggling, and wondering, I think I finally found the missing piece. 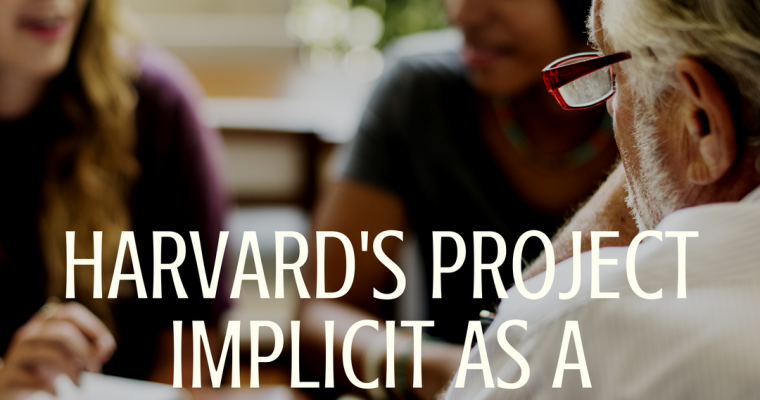 Teachers need direct, explicit instruction on how to change their own thinking. Truthfully, we spend a lot of time talking about and supporting student thought processes. 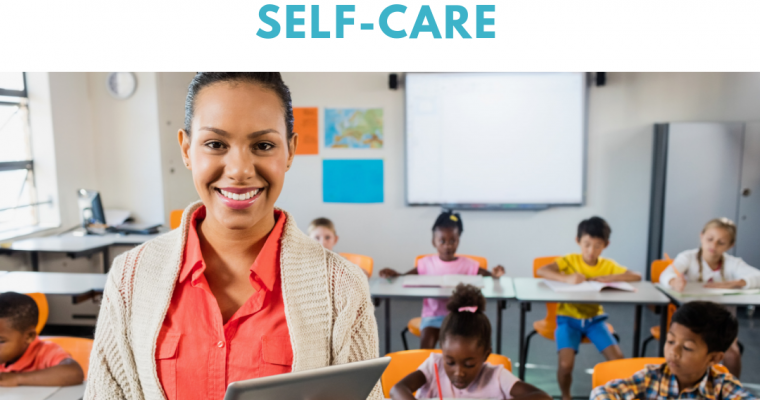 Self-regulation, self-awareness, self-talk are all part of instruction for students. But it is incredibly rare for teachers to receive the same opportunity to learn such skills. Instead of wondering why teachers fail to change their behavior, we need to question how we can help change teacher thinking. Not because teachers will all respond perfectly and all our implementation problems will be solved. It is never that simple. But because teachers deserve to understand not just what and why, but HOW. We need to equip them with the tools to control and actively select their actions and reactions in the classroom. This missing piece is especially pernicious when we are addressing deeply ingrained beliefs and behaviors. Teachers are often stymied by their own struggles. Hence the request for more training. They know, on some level, that they are missing a piece of the puzzle. Articulating what is missing is the challenge. 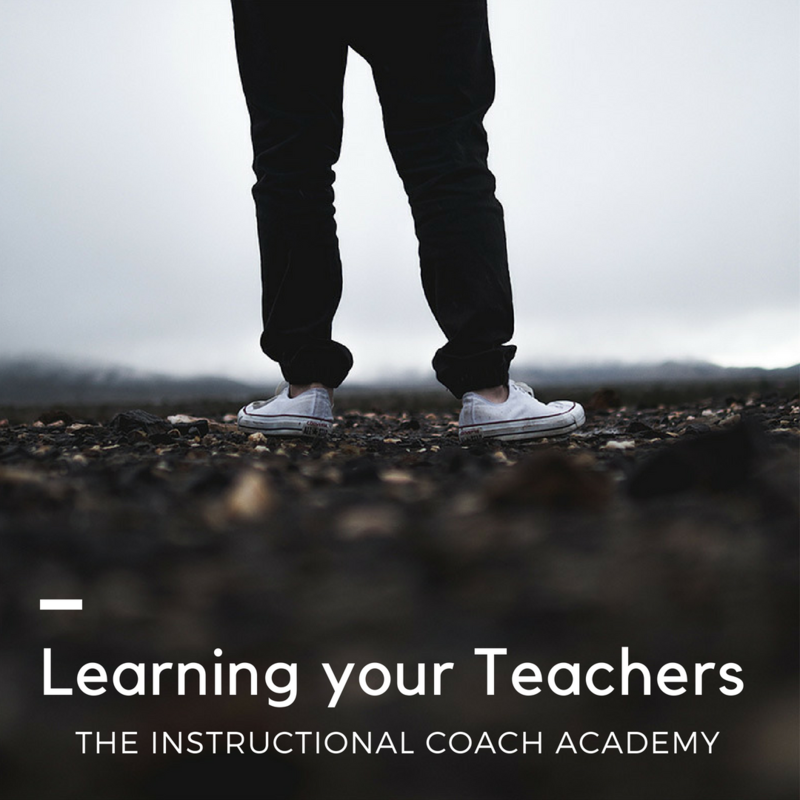 The answer lies in helping teachers surface their thinking, reveal existing inner monologues, and intentionally develop alternative self-talk and thoughts. Teachers need the same level of intentional, structured, and personal instruction that students need. The biggest problem with the missing piece is that though the need is there, the expertise, the materials, the strategies are also largely missing. As instructional coaches, we are left to address this need as best we can. The first step is knowing there is a missing piece. I wish I could offer specific resources and strategies that would magically fill the void. I can’t. If you have ideas or suggestions, please leave them in the comments for all of us. 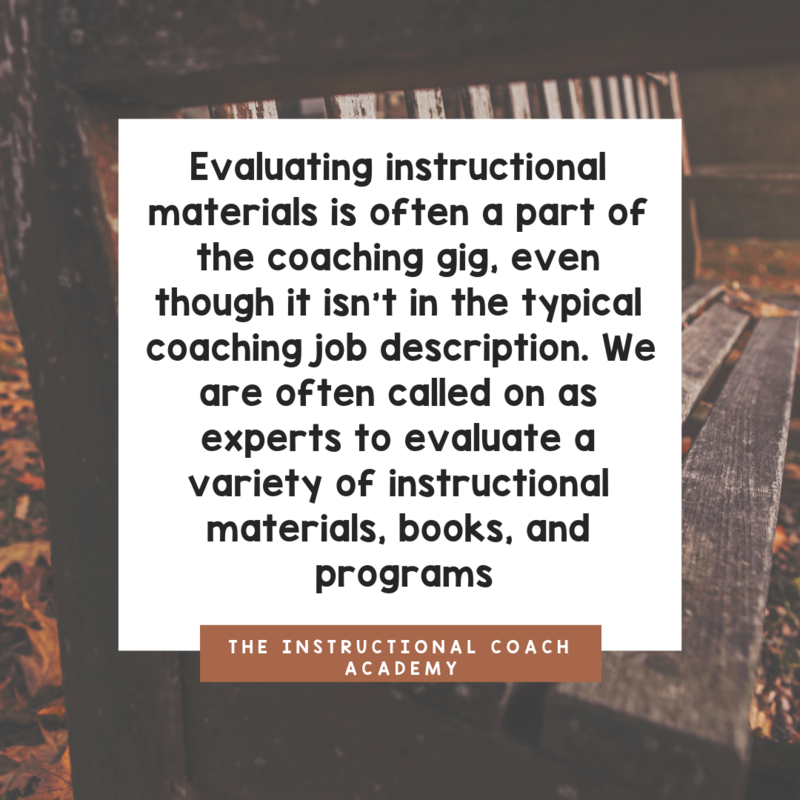 Evaluating materials is often a part of the coaching gig, even though it isn’t in the typical coaching job description. We are often called on as experts to evaluate a variety of instructional materials, books, and programs. There are so many things to consider when evaluating materials. It can be overwhelming and frustrating and hard to know where to start. Below is a process I have started using. So far, I am finding it useful. If you have suggestions, I am all ears. The first thing I do is define what I am looking for and why. What problem am I trying to solve? What features are essential to success? Why is something new being considered? At this point, I usually create a spreadsheet with those essential features listed. I make sure to leave a space to list the product. I also leave room for features I might not know about yet. Just recently, I started including a place to link the relevant website. Next, I gather possibilities. I research as many options as I can find. I eliminate those that are obviously not a good fit. The first couple of times I did this, I included every source I found. It was a colossal waste of time. I had to learn to trust my professional judgment. I also had to stop automatically dismissing anything expensive. Unless there is a specific budget, it is worthwhile to consider all the products. Sometimes the most expensive option really is the best fit. I enter information for each strong option into my spreadsheet with as much accuracy as possible. Depending on what I am looking for, I might have Y/N columns in my spreadsheet. I always write as many descriptive notes as possible. Many companies, especially for textbooks or software, provide limited pricing information. Once I have gathered as much as possible from available sources, I reach out to sales representatives. Contrary to popular belief, Educational Sales reps are NOT the enemy. Despite the need for them to achieve sales, they are the most helpful people you are likely to encounter. Many are former teachers. Though some will attempt a bit of a hard sell, they appreciate directness and honesty. If I am not a lead that will lead to a sale and I say so clearly, that benefits both of us. Most websites have a contact page that will allow you to submit a request for more information or contact a regional rep directly. Any spaces left on my spreadsheet can almost always be filled in by a sales rep for the product. In some cases, they will even research competitors to ensure the information they provide is relevant. Asking for quotes is easy. The first few times were really awkward for me. I felt like I was wasting someone’s time and who was I to demand information. I had to get over that too. Once I felt and acted more confident, I got better results anyway. Sales reps can also provide demonstrations of products in several ways. I can request a single copy of texts. I can ask for a demo account for software programs. The reps can set up live webinars or provide videos of the product. I have found that it is worth the time to thoroughly explore all the options and use the demos. If possible, I try to get as many teachers as possible to voice an opinion as well. Many questions about the product can really only be answered by using something. How user-friendly is the setup or interface? How similar or different is this to something teachers have used before? Will my teachers be open to it? Who will administer the program (set up electronic accounts or manage physical copies)? How quickly can this product be up and running? What will my administrator(s) love, hate, or question? Investing time in 5-10 products that you’re really interested in so you really know their value is much more useful than trying to overview everything. When all the legwork is done, then, and only then, I present my findings to the decision-maker(s). In my experience, people appreciate the depth of my knowledge. Teachers like being included in the process of reviewing different options. Administrators like knowing the pros and cons. I like feeling like I know my stuff. There are times, of course, when time doesn’t permit such an elaborate process. There are times when the materials I am seeking to evaluate are too narrow in scope or potential use to bother with this process. When that happens, I have to rely on my professional judgment and make a choice. In places where I have used this process, my choices have been viewed more favorably. I am rarely accused of making an arbitrary or ill-informed decision. 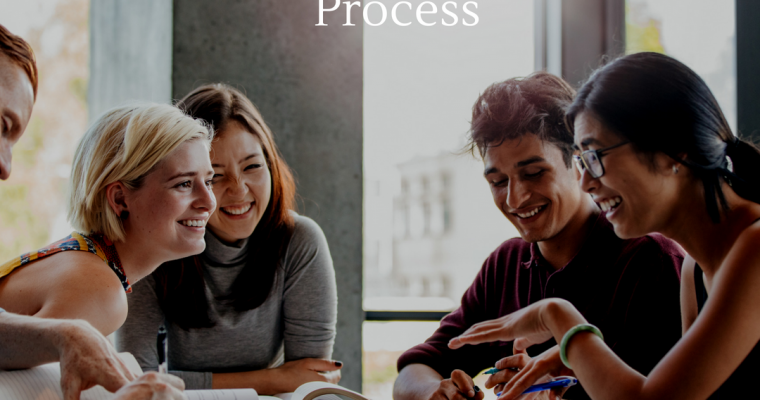 This type of process for evaluating materials does more than help you determine a wise course of action. It also builds credibility and trust. If for no other reason, that trust makes evaluating a variety of materials using a time-consuming process worth it. It helps that my teachers are also using quality products. Though it isn’t usually in the job description, finding and implementing curriculum solutions is a part of the job. It can be rewarding. 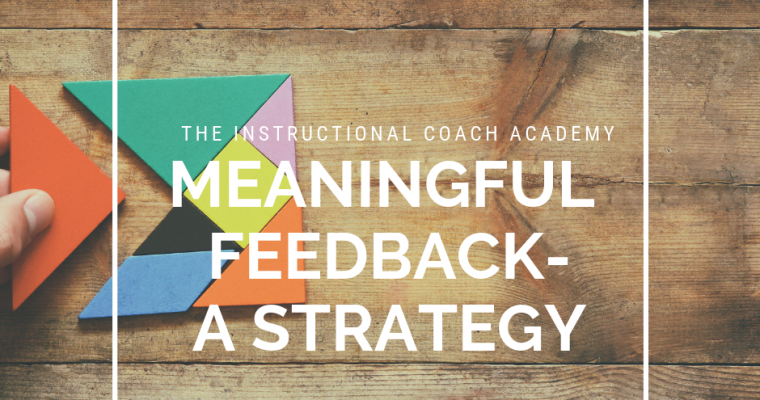 I believe that giving teachers the best tools possible for the goals they are trying to achieve makes everything else about coaching easier and more meaningful. Learning your teachers you coach is hard work. What do you need to know? What do you want to know? How can you establish a positive, productive working relationship? Where is the balance between coach and friendship? Coaching is inherently relational. Taking the time to learn the teachers, just as you might your students, is an important component of effective coaching. As the new year starts, working with a new group of teachers can be challenging. There are a number of things I find helpful to learn about my teachers. Personality-Whether it is True Colors, Strength Finders, or any other personality “test,” these exercises can be really revealing and helpful. Both the results and the way teachers approach and respond to the results provide valuable information. Processing style-Observing how each teacher processes information is incredibly important. Some teachers think out loud, others need time to contemplate information. Certain teachers are linear, while others have thought patterns that resemble a bird’s nest. Some teachers prefer to write before speaking. Paying attention to how teachers process can increase your effectiveness as you adjust your coaching moves to the style of each teacher. Learning style-Teachers learn in different ways, just as students do. Do first, see first, read first? What works for each teacher as a learner? Not only does this help the coach support teacher learning, it helps the coach fully grasp why each teacher makes certain instructional choices. Communication style-Are you working with any teachers who are conflict-averse? Who goes along to get along? 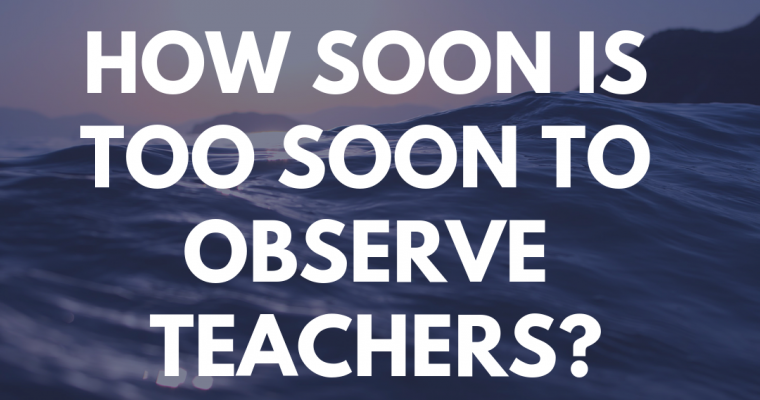 Are you working with teachers who are natural contrarians? Who loves to debate? Are some teachers naturally blunt, introspective and reserved, outgoing and social? Communication style is like learning style-identifying how your teachers communicate can help you both understand certain instructional choices and increase your effectiveness. If you are working with PLCs, learning your teachers can also help you facilitate and mediate group meetings. Love language-What makes your teachers feel appreciated? This one is easy to overlook; however, it can be the key to establishing positive, productive relationships. Who needs words of affirmation? Maybe that teacher isn’t ‘needy;’ maybe she needs words to feel validated, not just reassured. Who appreciates acts of service? The teacher who melts when you make his copies probably isn’t totally overwhelmed–he just takes your help as a sign of genuine caring. Who gains strength from simple touch? That teacher who feels supported by a shoulder squeeze isn’t more or less difficult to coach-just different. Who responds best to your undivided attention? A teacher who appreciates your extended observation isn’t being selfish-she feels cared about when you gift her your time. Love languages are not a typical teacher kind of tool. On the other hand, when teachers feel that you care and appreciate them, they are likely to be more receptive to your coaching. Professional boundaries-Which teachers keep their personal lives strictly private? Who hosts their teacher friends for regular social gatherings? 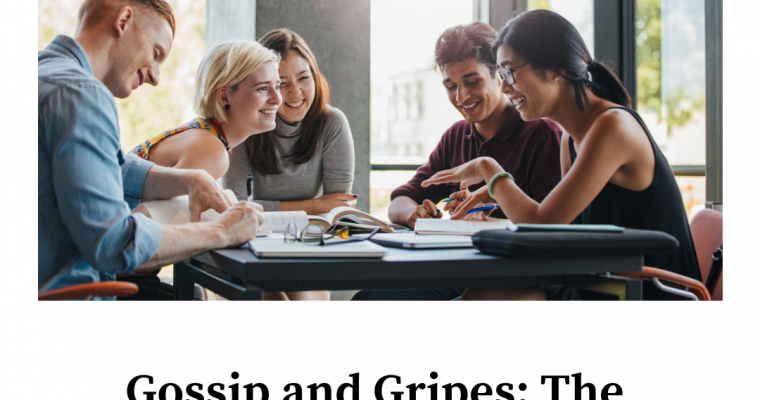 Do some teachers have few friends outside their teaching circle? 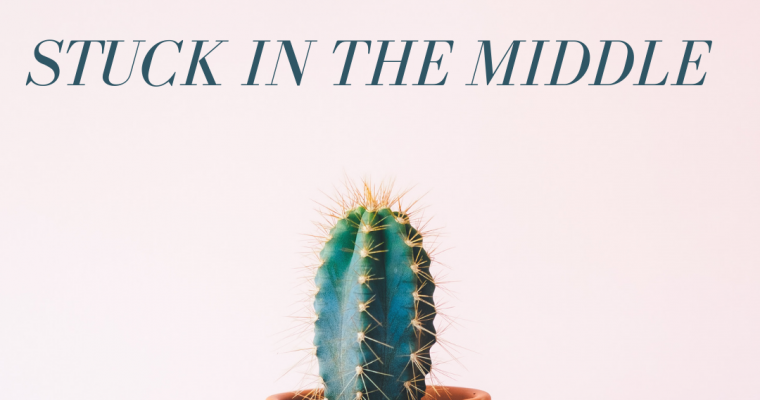 Are some teachers reluctant to socialize with those they see as “administration?” Learning how teachers view the line between professional and personal relationships can help you avoid potentially awkward situations. It can also increase your awareness of perceived bias. Some teachers will see bias towards teachers with whom you socialize more even if they desire no such relationship. Some teachers will see bias against teachers as a group if you elect not to join in social activities. As a coach, you can plan to negotiate the social balance more effectively when you recognize how your teachers view professional boundaries. I create a spreadsheet (that I absolutely keep 100% private) where I can note these things about each teacher. Doing so improves my individual coaching. It also helps me design professional development and group activities that meet the needs of all my teachers. Learning your teachers can be time-consuming, but it is worth the effort. Even the lens of learning your teachers can help you start the year in a positive way. In the long run, learning your teachers, in whatever ways work for you, will pay dividends later.